You may be wondering what the heck I was thinking. I'm wondering that myself! This was one LONG dayhike, fraught with ups and downs, views and non-views. But in the end, I can never be too unhappy about a day spent hiking in the Whites. My wife and daughter went to visit Great Grandma in PA for the week, so I had the whole weekend to myself. What better way to spend it than to hike a 4,000 footer or two? My plan was to hike Galehead on Saturday, and Eisenhower on Sunday. The astute will notice there is no trip report for Eisenhower (author's edit: I finally made it up Eisenhower click here for the trip report), and there's a very good reason for that. Read on! I planned out my hike for Galehead to take most of the day on Saturday, so I hit the trail at about 8:15 AM (the trailhead is reached by taking US Route 3 to the Gale River Loop Rd). A friendly gentleman offered to take our "before" picture so we got the shot and started on the Gale River trail. The grade is wonderful for warming up right out of the parking area. The trail is wide enough for one person and one dog to walk next to each other, but Kaia would rather run ahead to see what's coming. The Gale River rides shotgun with you offering some pleasant sounds to accompany your walk, as well as infinite opportunities to get water, wash your bandana, or just sit on the rocks. Scenery is limited at first, restricted to the forest and its less shy creatures. On this trip, the woodpeckers were particularly active. At about 3 miles, the trail bears away from the Gale River and begins a more earnest ascent to the Galehead Hut. The scenery stays pretty much the same; trees and more trees with the occasional view out over the valley. 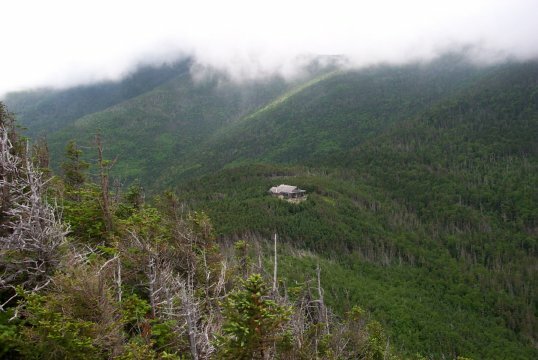 At 4.6 miles you reach the saddle where the Galehead Hut (3,800 ft.) is located and the first really beautiful views. From here much of the Pemigewasset wilderness is visible, especially in decent weather. Views of the Twins and lesser peaks are available, and the hut is an excellent place to rest, as long as you don't have a dog with you (which of course, I did). Let me just tell everyone that the AMC is very serious about their no pets policy in the hut. I made the mistake of thinking that meant there are no pets allowed to stay at the hut, but in reality it means your pet is not allowed to step paw in the building. Kaia was in there for less than 10 seconds (no exaggeration) before I had someone asking me to get her outside. So after a two-minute rest, Kaia and I headed up the � mile Frost Trail to the summit of Galehead. At about .3 mile, there is a rather beautiful scenic outlook that should not be missed, especially in light of the remaining trail's lack of views. Upon reaching the summit of Galehead, I was greeted with a completely occluded summit, so no views were available. But hey, it's one more 4,000 footer on my resume! At this point, I thought I'd check the time. It was 10:45 AM! All that distance and it took me 2 � hours! I had the whole afternoon left! So I did what any red-blooded American boy would do: I revised my plan. Given my time, I had two options. South Twin and Garfield were both in close proximity. So I checked the topo and saw the steep climb on South Twin, so Garfield was the winner. I'd already hiked both in the past, but what heck, right? So I headed back down the Frost Trail, past the hut and onto the Garfield Ridge Trail. I breezed right by the Gale River Trail on my way to Garfield with energy in my legs. On the topo map, the Garfield Ridge Trail looks pretty reasonable, with some ups and downs, never really gaining or losing too much elevation. This is accurate and you never really go up or down significantly, until you near Mt. Garfield itself. Some real climbing starts about two miles from the junction of the Gale River Trail. At 2.2 miles, the short trail to the Garfield Ridge campsite diverges off to the right. This site offers a fantastic spot to camp at altitude. From the campsite branch, the trail continues at a very steep grade up to within 100 yards of the summit. And when I say steep, I mean steep! At one point, I had to lift Kaia to get up the trail! There are some sections that are near vertical, so keep this in mind if you plan this trip. The summit of Garfield presents itself at 2.4 miles past the junction of the Gale River Trail. 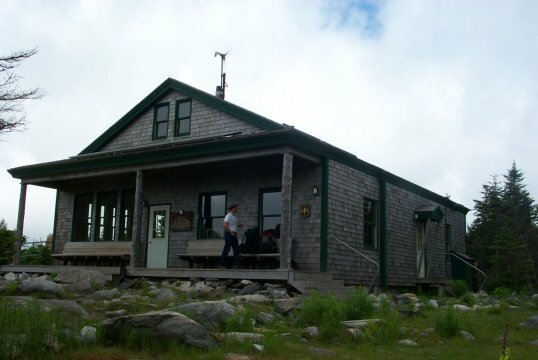 The summit is large and fairly flat, with the foundation of an old fire tower near the Eastern side. Views are spectacular in all 360 degrees. 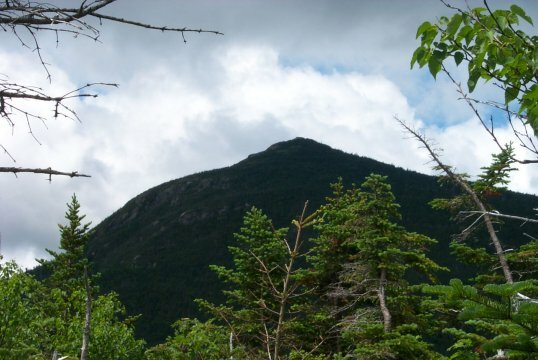 In fact, I think the summit of Garfield has one of the top five views in all of the White Mountains. The summits of the Twins, Galehead, Lafayette, Lincoln, (more�) are all within easy view in good weather. On this day, the views extended at least 100 miles. To add to the experience, on this day three gliders flew silently by. I couldn't help but be envious. 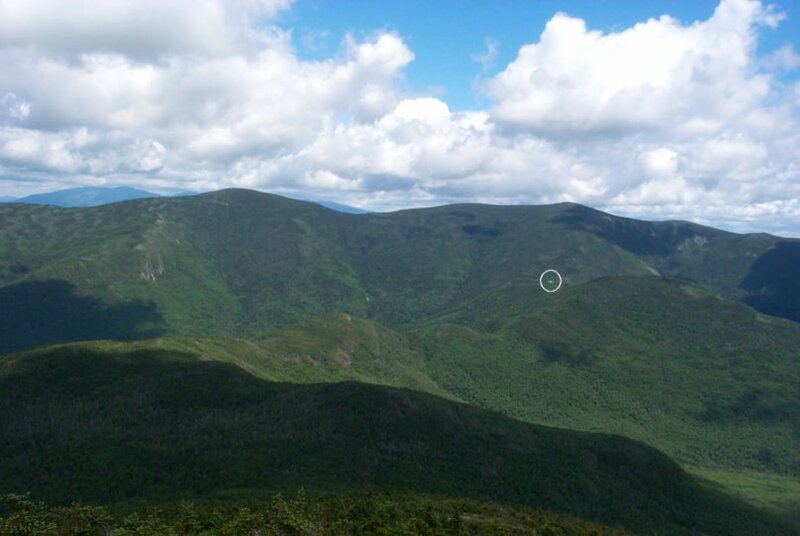 If you click on the photo, you can see the Galehead Hut in the distance (in the white circle). The twin points of Lincoln and Little Haystack can be seen from Garfield, as can many other 4,000 footers. Considering it was the 4th of July weekend, the summit wasn't all that crowded. A group of ten went through, but overall there were only 8 or so people on the summit at once. So after a short rest, some lunch and some photos I made my way back to the Garfield Ridge Trail. After .2 mile I reached the junction of the Garfield Trail. My plan was to descend the Garfield Trail and complete my loop by walking the last mile on the Gale River Loop Road. The top of the Garfield Trail gives you an excellent idea of condition of the remainder of the trail; gradual, well-kept, and not too rough. In fact, as I descended, I noted that I've rarely been on a trail that is as pleasant to walk as the Garfield Trail. The grade is extremely consistent and gentle with good footing. 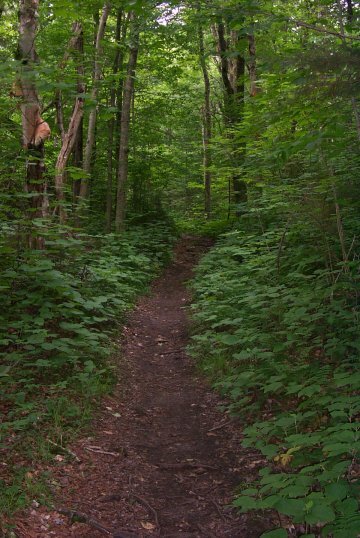 There are few if any difficult sections of the trail and I was able to move rather quickly down towards my destination. I passed several people who were headed up towards the summit, getting a late start, and everyone got an earful about how nice the scenery was. At about three miles from the junction of the Garfield Ridge Trail, there is a crossroad with a snowmobile path. This path is not on the topo map I had from the White Mountain Guide's 27th edition, and I had wished it was. I hiked out the remaining 2 or so miles and as I walked up the Gale River Loop Road, I noticed that this snowmobile trail led straight to the road. I could have cut about � of a mile off my journey if only I had known. Oh well. It was a beautiful day, and I was ready for a cold beer. I finished off the last mile back to my truck and packed up. Overall, this was an aggressive hike for one day. I began at 8:00 AM and finished at about 4:00 PM. Kaia and I were both spent, and my plan to hike Eisenhower the following day was scrapped in favor of a day relaxing by the Amonoosic River. As I write this report three days later, my legs are still sore, but that won't keep me from playing hockey tonight!